Big law firms deal in big numbers: as Greg Taylor, head of IT at Ward Hadaway, explains: "There's an old joke that law firms have more IT than NASA." The joke is an exaggeration, but only just: with offices in Newcastle, Leeds and Manchester, Ward Hadaway has more than 400 end users running 50 different software solutions. Taylor knew that simplifying Ward Hadaway's IT management would deliver significant savings, but even he was surprised by how significant those savings turned out to be. Law firms' customers don't just expect favourable outcomes. They expect value for money too, and that means keeping costs on a tight leash and maximising efficiency at every opportunity. Ward Hadaway had already automated some of its software distribution, patching and inventory control, but the existing tools were complicated and the firm's requirements were particularly demanding. "Our PC builds are more complex than those in other businesses," Taylor says. "Our standard image includes 12 pieces of software." "Our key goals were to increase the IT team's efficiency and give end users better service, in turn giving us the ability to serve our customers more efficiently," Taylor says. The firm had already decided to deploy 350 Dell Optiplex desktops running Windows 7 across its Newcastle office and used a Dell KACE K2000 Deployment Appliance to automate tasks such as PC image builds. "We can deploy a standard image build on a PC in just a few minutes," Taylor says - a vast improvement over the previous tools' half-day build times. As a result, "IT personnel spend more time responding to help-desk calls instead of image building. And the staff gets their new PCs quicker". Impressed by the KACE K2000, Taylor opted for the even more powerful KACE K1000, which delivered "everything we needed" - and thanks to Dell's KACE JumpStart programme, "we knew the solution thoroughly after just a couple of two-hour sessions." Ward Hadaway has invested heavily in Dell solutions - its current environment includes 12th-generation Dell PowerEdge R620 Servers and Dell EqualLogic storage arrays, with all key virtual machines replicated at a separate disaster recovery location - and Taylor is very pleased with the results. "We've gained higher virtualisation server density with our Dell PowerEdge services," he says. "They've provided us with greater scalability and reduced our cooling costs because of their energy efficiency." That isn't the only efficiency Ward Hadaway's systems have delivered. 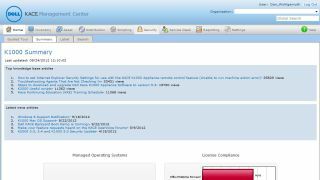 The KACE Management Appliance automatically monitors licensing numbers, enabling Taylor to carry out a full-company license review in less than an hour without disrupting any staff or affecting the performance of their PCs. Software rollouts that used to take weeks can be achieved in less than half a day, and IT staff are spending more of their time on what really matters. "Because inventory management is so efficient with the Dell KACE Appliance, there' sno risk of staff being disrupted by licensing matters," Taylor says. That means "we can spend more time helping personnel provide even better services to our customers."